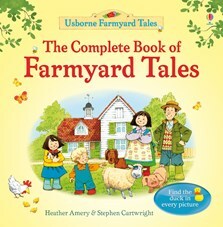 A delightful collection of all 20 of the enduringly popular Farmyard Tales stories featuring Mrs. Boot the farmer, her children Poppy and Sam, and a host of friendly farm animals including Curly the pig and Rusty the dog. Illustrated with gentle humour by Stephen Cartwright, with the lovable Little Yellow Duck to spot on every page. Includes favourites that have delighted children for three generations, such as “Pig Gets Stuck”, “The Runaway Tractor” and “Camping Out”. A beautiful gift that will be read again and again. I am a big fan of Farmyard Tales. I have the mini series, but I have always wanted to have all the stories together in a single book. The complete book is a work of art. Shiny cover, beautiful pictures, "heavy book" - more than 300 pages. From my point of view it is a perfect gift for kids of any age.